I was the last one in my family to move out of the family home. After Dada left for his graduate studies four years ago, I was left in charge of accompanying Baba to weekly trips to Sunday bazaar, fetching hot samosas from the shop on corner when the guests drop in unannounced, help Ma carry the coconut, flowers and mithai on her way back from Satyanarayana puja. To be honest I have never been one to complain but then there was the occasional reward of an extra gulab jamun or samosa. In my knowledge no one is capable of turning down such a lucrative offer. All roads to my heart lead through the stomach. A fact Ma was aware of very well. It has been more than a decade since those days. Dada and I have completed our studies, taken up jobs, moved cities and countries, Baba and Ma have grown older and settled down in an apartment. Their daily routines have changed, the pace of life has slowed down with age and time taking charge. For us their health and security continues to be a matter of concern especially during the times we are unable to make that trip to home. In the light of these events, we decided to go the smart way. Good health is a quality pursued not only by the young or affluent. From the next door six year old to my sixty year old Ma, everyone desires good health and works towards it. It can be as simple as consuming a glass of warm water with lemon in the morning. We are driven by numbers and to see our goals quantified gives a sense of achievement and satisfaction. Fitness bands are a wonderful option in this regard. They not only track basic details like steps walked, calories burnt but also vital information like heart rate. Smart watches are another option to consider in this regard. Once paired with other smart devices like mobile phone or smart TV, they can be used to receive phone calls, read messages – they can perform all of these functions in combination with the primary features of fitness tracker. My father is an old school man. It took us one birthday gift to persuade him to try and test the merits of a smart watch. He loves that this gadget on his wrist is a time piece, can read his heart rate and tell him about the number of steps taken in the day. He no longer has to give an estimated figure to his doctor when posed with questions about his heath. He has the data available at hand. In, his case, the wrist. Now that is Smart Wearable! I was a firm believer that security cameras are a thing for banks, corporate offices and malls. After all for housing security purposes there is always the guard on duty 24/7. The need to have a camera didn’t seem important. Until a stray incident which occurred at a nearby residential apartment. We chose not to rely on the decision making skills of the housing committee and after a careful research got a smart security camera installed for our parent’s apartment. With the device, folks can now see the people standing outside the door and can choose if they want to give them access or not. With in-built features like motion detectors, it proved to be useful feature notifying us each time someone approached the door. We installed the standard application for the security camera on our smart phones and could access a video feed of this information sitting far away in a different city! My mother had the most marvelous experience of all people. From the milkman to the maid, now one can make false claims about knocking the door and leaving after getting no response. She is mighty proud to have proof and calls them out on their bluff. With the Google Home connected to all the smart devices at home, now all the information can accessed online and by a voice command. My mother loves it when she says, “OK Google! Play Hanuman Chalisa”. And the melodious voice of Anup Jalota fills the room, without Ma leaving the kitchen or getting up from the comforts of the bed. Talk about a Smart Home with a Smart Camera! This post is written for the #GetFitwithFlipkart contest hosted by Indiblogger. Arizona is known for its blazing hot summers and abnormal high temperatures. Usually by the month of February we have our winter clothes packed off, with just light jackets proving enough to battle the cool spring air. But not this year. March will come to an end in another two days, here I am still bundled up in my sweatshirt and fleece pajamas. The other day, the UPS delivery guy looked at me disapprovingly about my choice of outfit. I cannot deal with low temperatures. I try to reduce my activity level, keeping movement to a minimum, working hard on preserving the tiny bit of body heat. Last afternoon after cleaning out the kitchen, I sat down with my cup of green tea. Mindlessly scrolling through the Google Photos, my thumb stopped at the one from my last trip to India. Baba had brought hot jalebis and samosas while out on his daily morning walk. That morning my 30 minute yoga session ended much quickly. The sight of saffron colored jalebis and aroma of fried samosas are powerful means of persuasion. My fitness motivation staggered and crumbled as I quickly finished the remaining of the routine and ran towards the breakfast table. While I continued to reminisce over that glorious breakfast of the year past, my taste buds in a spellbound state craved for the familiar cardamom laced saccharine drug. Since there is no mithai store at the nukkad in Arizona, I was pushed to take matters into my own hands. 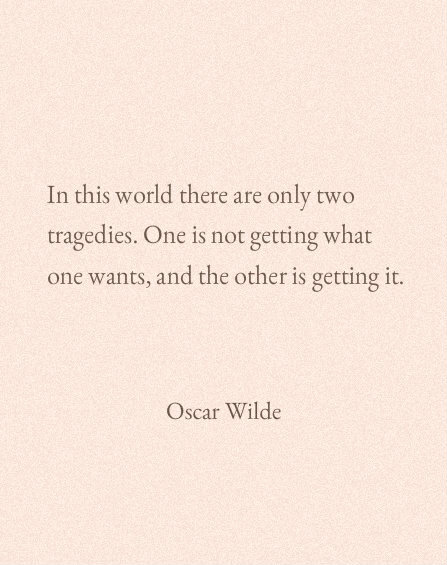 Hunger can be a compelling motivator. It also lead me to prepare one of the most loved desserts in my kitchen. Being born as human we are immediately set out for a life measured by societal standard. The education on this massively vast subject starts early in childhood. No matter how boring Mimi Aunty’s talk about her maid’s shenanigans, I was not allowed to show any sign of disinterest. I was brought to believe that it was impolite to interrupt people, especially elders, when they were in a sermonizing mode. Growing up my enthusiasm and attention for subject matters of the more serious kind was dangerously low. Dangerous because I was a soft target of the many aunties and kakimas who sought a candidate to dole out their weekly gyan. The law of attraction seemed to work in a miraculous ways. Wedding party to birthday dinners, rice feeding ceremonies to satyanarayana pujas – no place was sacred enough for the overzealous aunties. As a school going student, the advice almost always centered around career choices. Engineering seemed to be a favorite with many. This was not surprising since my hometown Jamshedpur is studded with coaching centers promising boys and girls that much coveted top AIR and a seat in the top colleges. And of course every mother dreams of saying, “my child goes to IIT xyz” in a nonchalant manner in any conversation. Even polite conversation with absolute strangers in the supermarket would be presented with the fact. Doesn’t matter if they are not even on first name basis. I was often accosted with a copy of Austen or Hemingway under my arm and got admonished for my literary choices. It has been more than a decade of graduating from high school and college. The questions and strings of advise didn’t ceased. They continued to catch heat while I worked my way through the corporate ladder, got married and moved out of the country. Meanwhile living in a different continent across oceans hasn’t undaunted the spirit of the nosy neighborhood auntie. When I sit down to examine the various levels at which their curiosity is displayed, I end up shaking my head in sheer disbelief . Last year while visiting home, every auntie I met made it their business to ask about my future plans with regard to expanding the family line. While I made some incoherent reply they grabbed, hugged and touched my belly with undisguised liberty. It was just for a moment, that was what my mother claims, but for me it felt like a lifetime. I struggled to make sense of the ‘affections’ and ‘interest’ bestowed upon me. While a good time had passed since that rude incident, another phone call from home brought back terrorizing memories of the aunties. They had deemed that based upon my age in the biological clock and current state of unemployment, I should embark on the family planning business. At times I wonder, if they remember at all, that marriage and child-making is a two people affair. Running after one of the participants armed with a scythe and saccharine loaded words is futile. Their discussions are often about people who are clearly absent from the company and most times have no direct relationship with those involved. While the question about the sincerity of their ‘interest’ remains open, we are often left oscillating between marveling and cringing about the incredible human resources and networking skills of the friendly neighborhood auntie, striking terror in every child’s heart since they are born. 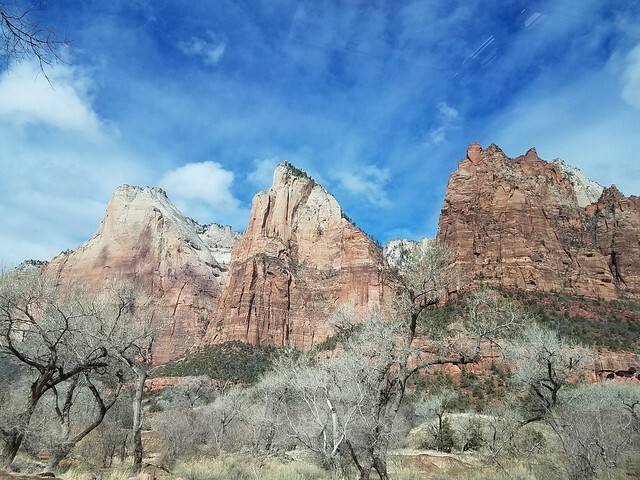 A trip to Zion has featured for a long time in our place to visit list in USA. Two years ago while planning for a trip over the Labor Day weekend, we decided to visit Bryce Canyon National Park and Zion National Park. While the trip to the former was roaring success but the latter was a failure from the beginning. We made two attempts on different days. Each time we drove through the entire length of the park failing to score any parking spot. 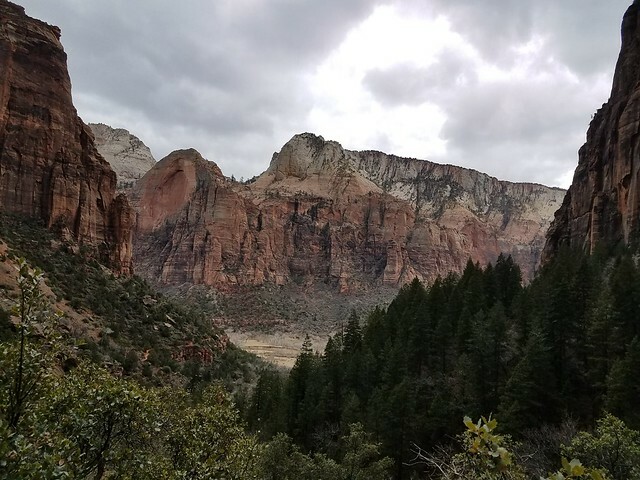 It was a huge disappointment and for a long time I could not talk about Zion without saying a silent prayer. 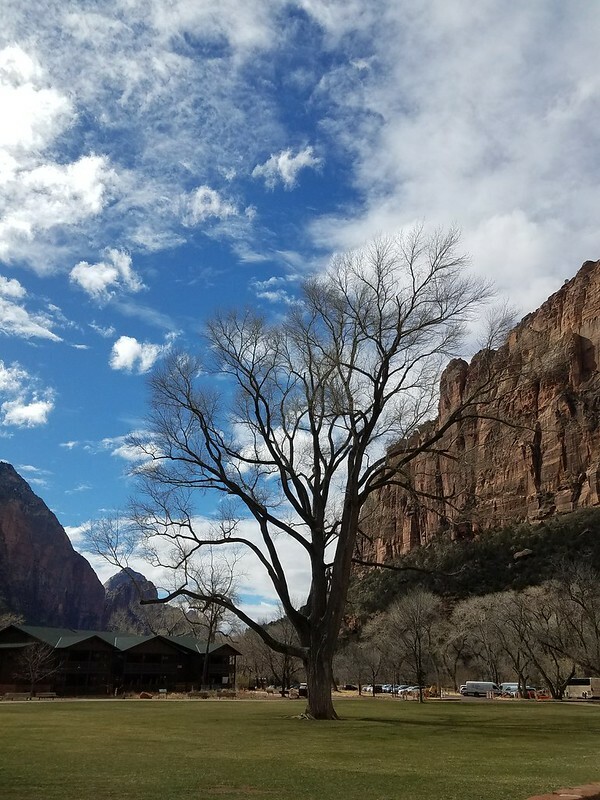 Zion National Park is one the most iconic parks in Utah. 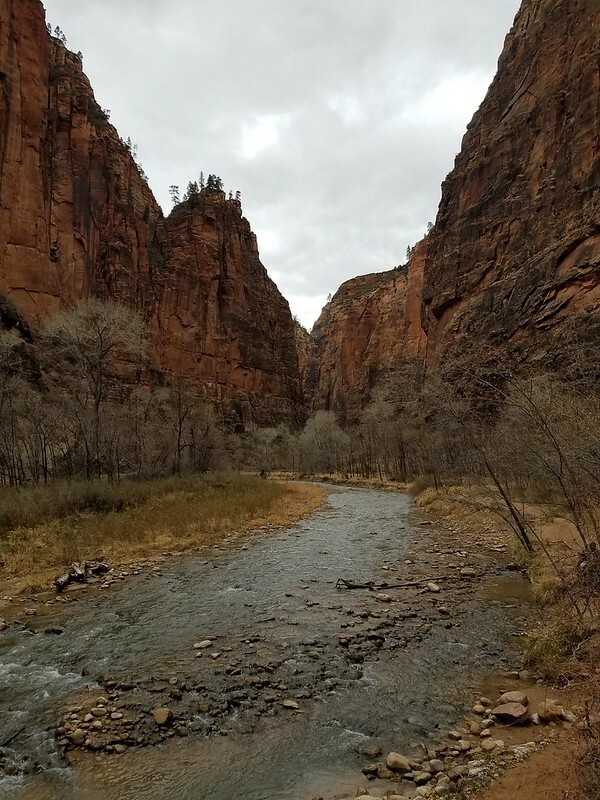 It is famed for tall red cliffs along which flows the Virgin river. 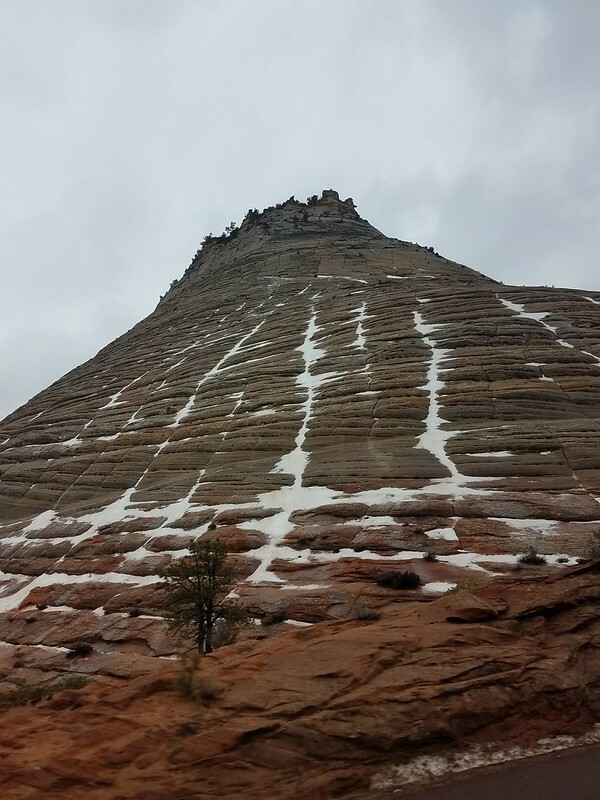 Some of the most famous trails include Angel’s Landing and the Narrows. Since neither of us really have a stomach for heights, the former was out-rightly rejected. 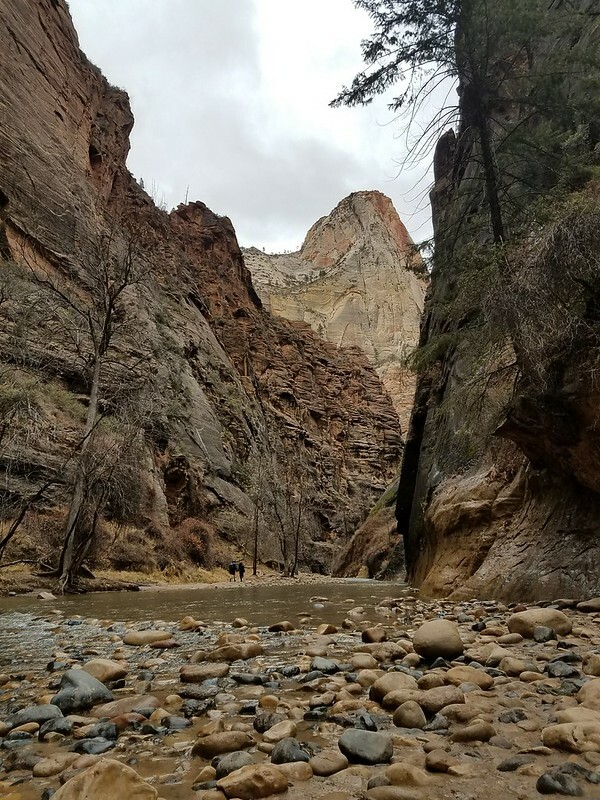 For a hike through the Narrows, one literally wades into the river to make their way through the canyon. Since we didn’t come prepared with water resistant footwear, clothing and walking sticks, we had to give it miss. The weather channel had forecast clouds with spot of rain. We were fortunate enough to be blessed with cloudy grey sky with zero sign of showers. The mountain smelled of cold wet leaves, fresh clean air. I greedily took in long deep breaths, acting in an utterly shameless manner. But who can blame a city dweller like me? A nature retreat is rewarding in so many ways. Its an act of cleansing the holy trinity of body, mind and soul. Also it is a good idea to not fret about the loss of network on your mobile device, as reminded by my better half in the many moments I was tempted to share the photographs on Instagram or post an update on Facebook. Jules Verne’s Journey to the Center of Earth put forth the idea of a second world existing right underneath our feet. This world had glow birds, dinosaurs, hot springs, rocks floating in air – as a child I was spellbound by its mythical magical aura. I sincerely believed in the existence of this place. For a long time visitors to our house in Rourkela would be regaled by tall tales of this subterranean land near Iceland. To anyone who would bother to listen to a ten year old bursting with excitement about an imaginary place, this might have come across as absurd or annoyance but I guess back in those times adults were more forgiving. As struggles of balancing high school along with preparing for college exams took over, the flighty dream of that ten year old lay forgotten in a dark corner. 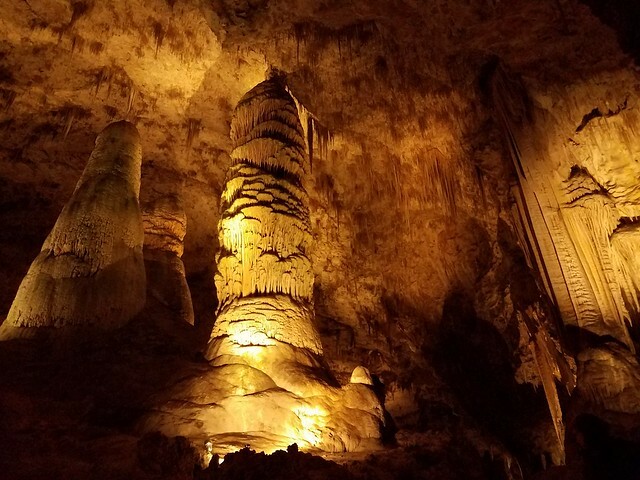 Coming to Carlsbad Caverns National Park which is located in the south eastern New Mexico, it is known to be just one of the 300 limestone caves formed on a fossil reef about 265 million years ago. The timeline which led to these magnificent formations is just staggering. Mankind is just a blip! Though primarily our exploration would take us underneath the earth’s surface, we could not disregard the weather conditions. 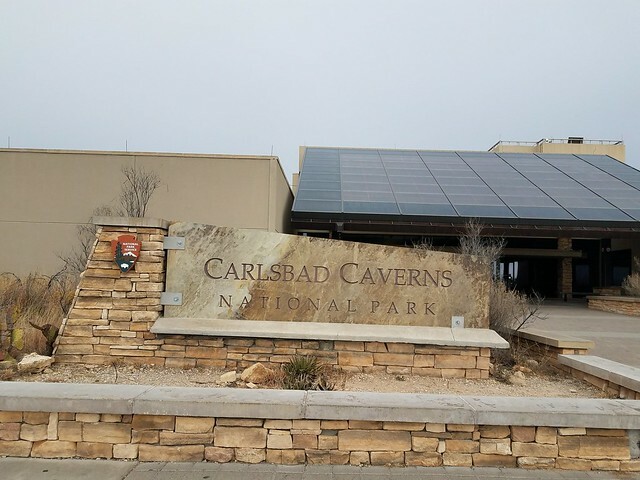 As the hotel prices in Carlsbad were a little on the higher side, we decided to set base in Artesia which was only an hour and ten minutes away from the park’s visitor center. 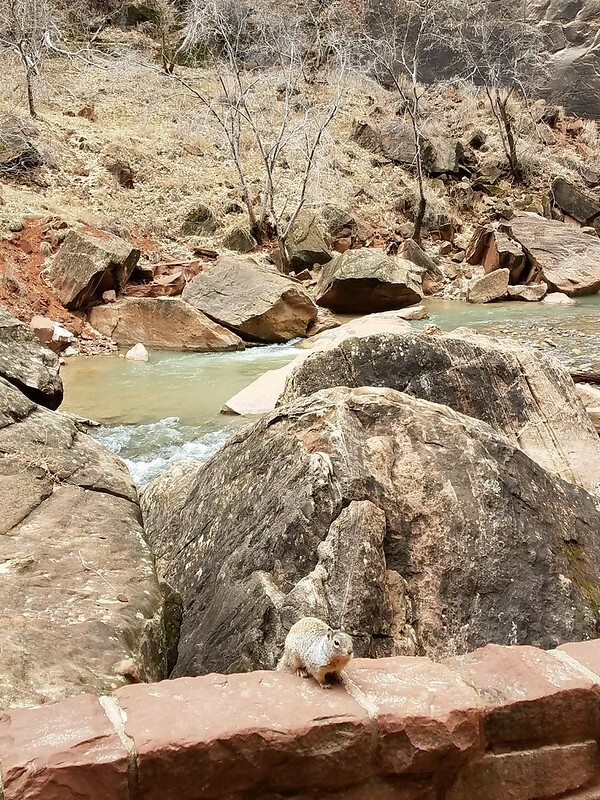 Most reviews on Tripadvisor and Google Reviews had suggested that we get there early to beat the long lines and get tickets for any park ranger led activity as they have a limit and tend to sell out quickly. As an option, you can book their tours online also. 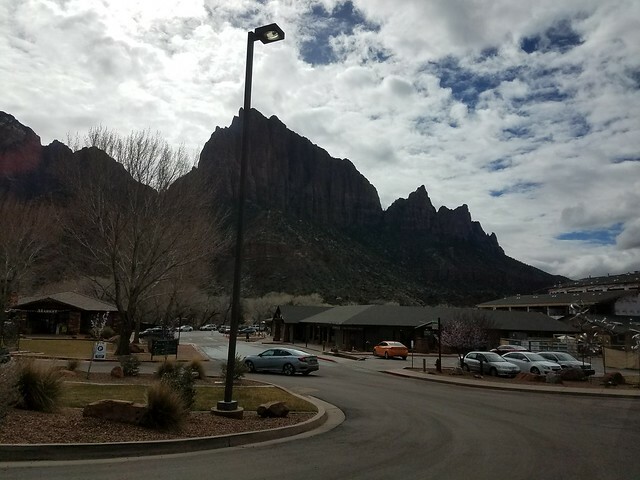 Travelling from the warm temperate climate of Arizona, we were not ready for the blasting bone chilling cold weather of New Mexico. We checked in at the visitor center to collect our tickets for the tour and lined up for the elevator. 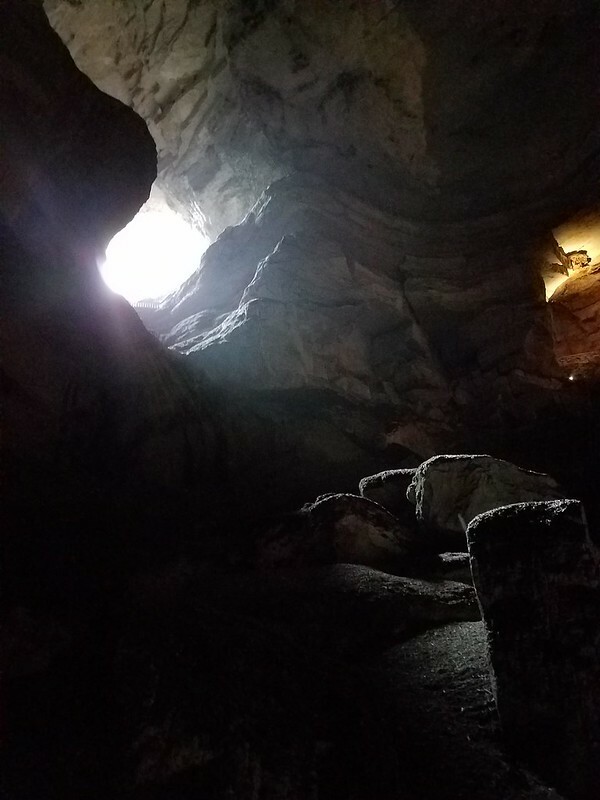 Now there are two ways of entering the cavern – hike a 1.25 mile route from the Natural Cave Entrance or take the elevator. People had highly recommended to take the elevators for descent and opt for a hike out for exit. For a seasonal athlete like me it was true test of endurance. But the sight of open sky and sunlight streaming down from the gaping hole is every bit rewarding. 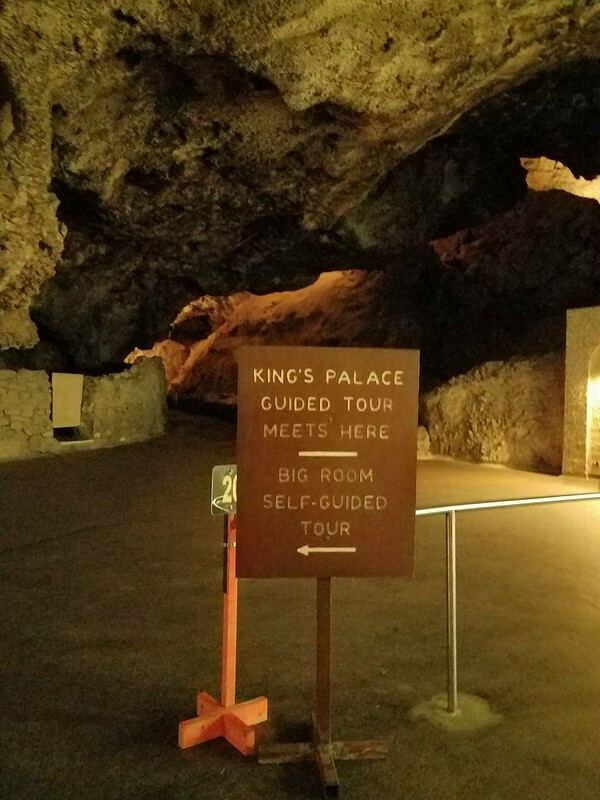 King’s Palace is a collection of four chambers which are located in one of the deepest pockets of the cavern, about 830 feet below the earth’s surface. 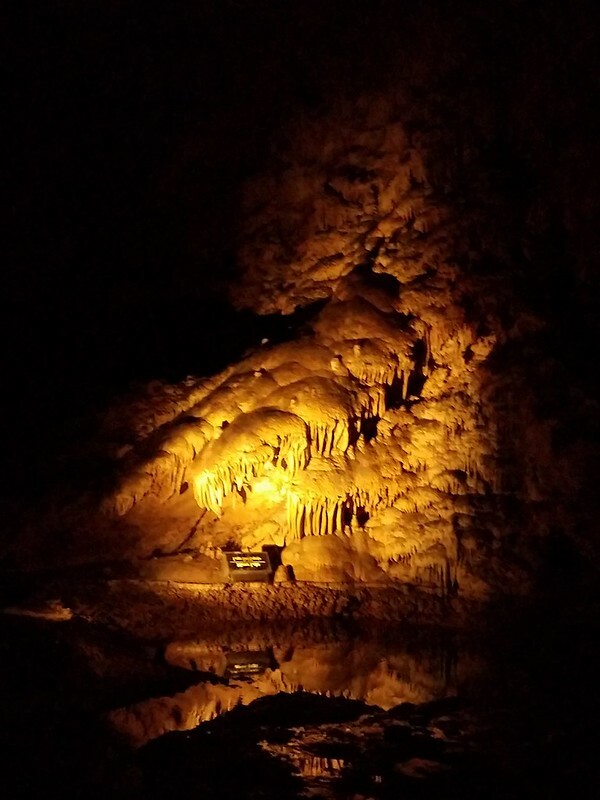 Our tour was led by Park Ranger Charlie who along with the usual fact and figures shared fascinating accounts of the first man who discovered these caverns back in 1898. Back then Jim White a 16 year old had descended with nothing more than a lantern, kerosene and a few matchsticks. We got a taste of the old world feel when Ranger Charlie turned out the modern lights save a candle which he had brought along. He gave a tiny scare when he snuffed out that too. Inky darkness enveloped us. Darkness so thick you can’t see the person next to you. Also with the absence of sunlight one has absolutely no sense of time. The King’s Palace tour was an hour and thirty minutes long and cost us a nominal $8. It is worth every cent as it gives access to a location which is otherwise closed to general admission. Later after the tour ended we spent the following hour exploring the Big Room which is said to big enough to house 6.2 football fields. 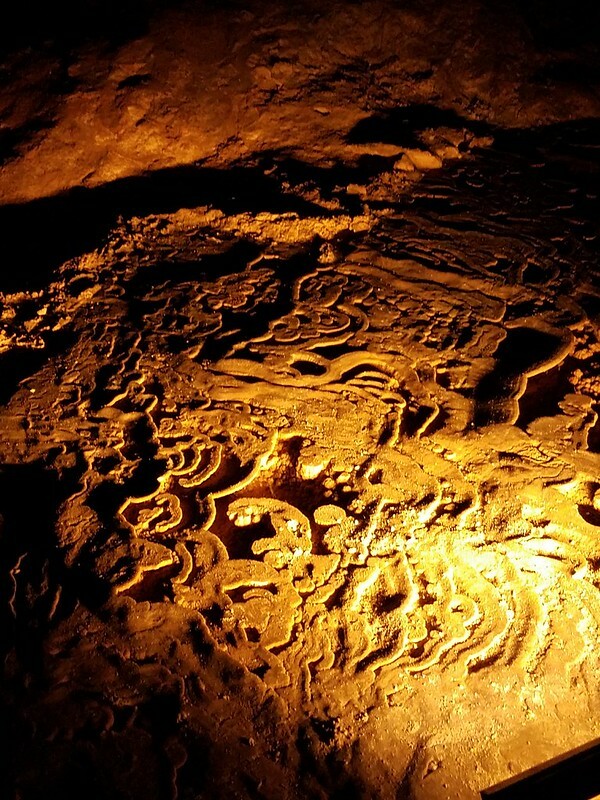 Most of the formations that are seen in these parts are a result of sulphuric acid on limestone. 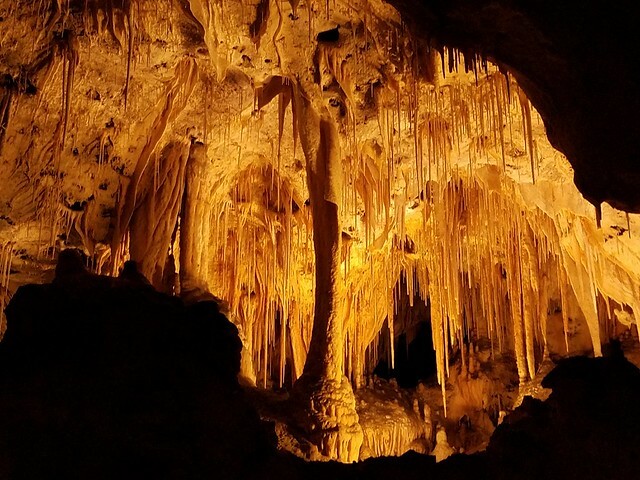 They are primarily classified as spleotherms, stalagmites and stalactites. The formations are crude, gory and as is human nature we try to anthropomorphize them. So there is the Witch’s foot and broomstick, the Devil’s play garden. 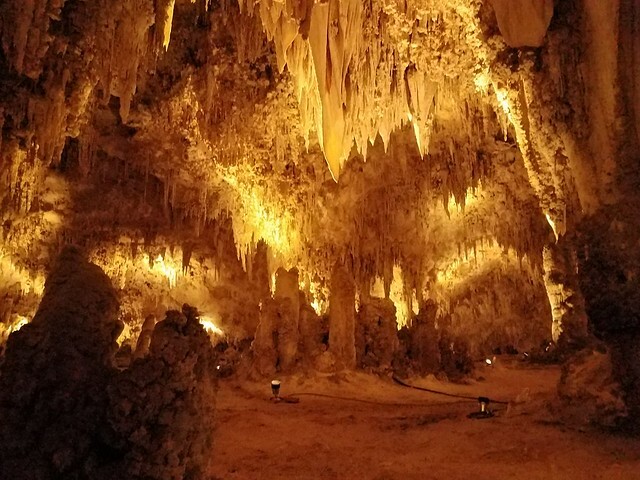 On a first glimpse the caverns appear like a badly lighted subterranean castle of Ursula from the Little Mermaid. But as my eyes grew accustomed to the dark, it saw these detailed patterns and textures on the walls, floor and ceiling. Nature had taken million of years to carve out this piece of work. The magnanimity of this thought left me giddy in the awesomeness that surrounded us. Finally after spending about five hours exploring the various pockets of the caverns, we decided to hike out. The total distance of 1.2 miles doesn’t account but combined with an 800 feet of elevation it is a lot of leg work. I have to be honest and admit that despite the shortness of breath, burning cheeks, bursting lungs and sore legs, we made it out. 35 minutes. Boy it felt great to be back on top! 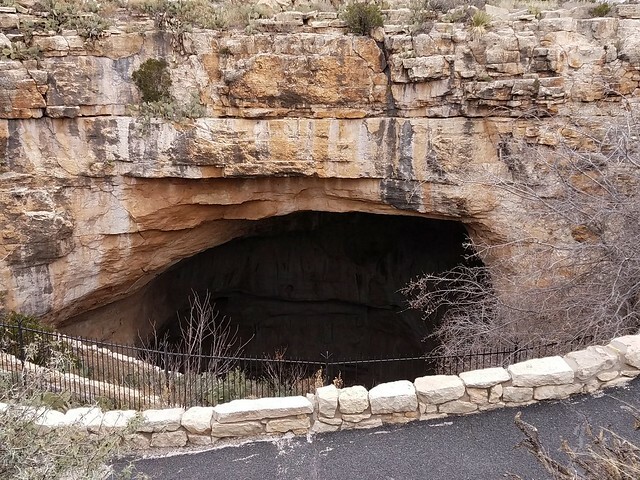 Looking back, it wasn’t until this trip to Carlsbad Caverns I got thinking about that long forgotten part of me. It ended up being realization of a childhood promise made to self in all innocence. Every week after we pick up the grocery I sit down with my red sticky notepad to plan meals for the following week. Between providing a healthy balanced food for every meal and catering to the house inmate’s (the husband) preferences, it is always a delicate balancing act. A doting Indian mother who keeps away all hideous looking vegetables with appalling shades and ensures that every meal served has a favorite item of her darling child, not only gains a place in heaven but also in her child’s heart (which sentimentally speaking is equivalent to swarg for her). Following tradition, the husband refuses to eat beets, rolls his eyes at papaya and recoils with disgust at the sight of an innocuous vegetable like lauki (bottle gourd) which is famously known as eyesore in our household. So it’s not a surprise that the final list takes a good 30-45 minutes to be ready and go up on the refrigerator door. Yesterday we got a decent haul of fresh vegetables. It was a Monday evening, but the advantage of dropping into the Asian market on a late weekday evening are one too many. It means less chances of being pushed around by the carts, more browsing time and no maze to negotiate. I am not exaggerating about the crowd that storms the store on a regular weekend. Most often my challenge lies in the pile of green beans. It is common knowledge that there are always more than enough broken or cut beans hiding in the pile. To weed out the bad one and select the sturdy good ones needs time. Something which the person standing next to you clearly is running short of and looks impatient as you guiltily turn over the pile in hope of finding some good ones. Phew! Quite a few times I had to make trips mid-week when I failed to score a spot at the green beans counter and it was Hakka noodles on the dinner menu. After preparing a meal of pui saag chochori (a medley of malabar spinach, pumpkin, radish and potato), korola r torkari ( sauteed mix of bitter gourd, brinjal and carrot) – both of which are highly rated and approved by the husband – I had a challenge at hand. Last night I was unable to come up with a dish to incorporate the innocuous jhinga or ridge gourd. An alu jhinge posto (potato and ridge in a spiced poppy seed based sauce) is always an option but the Bangali in me refuses to share anything that has posto. So I decided to go back to an old favorite of mine. Not prepared by my mother or grandmother, but introduced by good old hostel canteen. 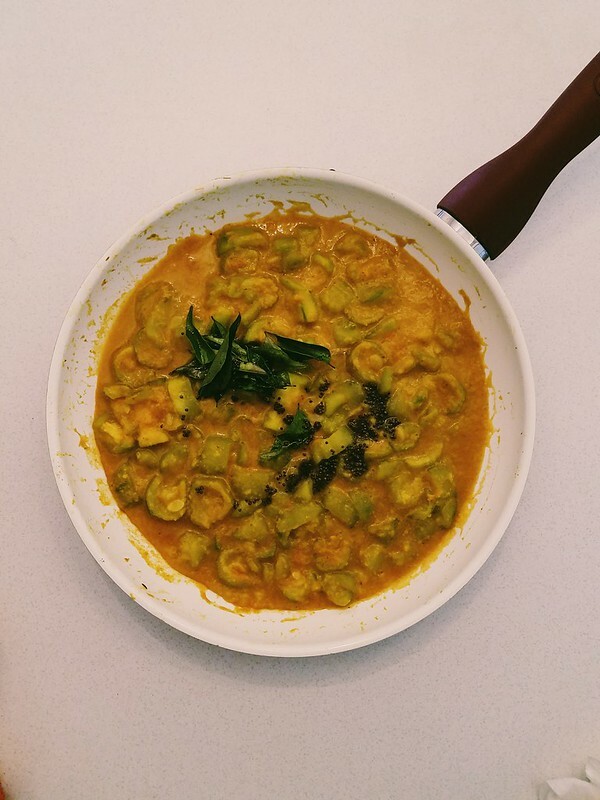 A creamy, mildly spiced kootu. As an outsider to the south Indian cuisine, I would describe kootu as vegetables in a coconut lentil based sauce. Its healthy, vegan, vegetarian and delicious. After that final tempering of mustard seeds and curry leaves, I was literally transported back to Chennai. My close friends know the immense love I have for kootu. Recreating this in the space of my kitchen left me feeling happy and satisfied. Food has this strange powerful effect on me. Recipe sourced from old reliable Google. I plan to serve it with hot rotis for dinner. Will await for the husband’s verdict on this one. Birthdays are a completely different deal as one turns thirty. While I am still a few months shy of hitting the golden number, the husband is taking it quite hard as he is already on the other side. He says the luster of birthdays wore off ever since adulting has taken over. To uplift his wilting spirit I suggested a trip to Death Valley national park to celebrate his birthday. He took a shine to it instantly and kept turning the idea of “celebrating birth in Death Valley” in his head. A drive from Phoenix to Furnace Creek, where the visitor center for Death Valley is located, is a good 7.5 hour away. This meant we had to abandon our initial plan for making a daylong trip. Not even a travel enthusiast like the husband can pull off a 13 hour drive. Hence we decided to drive straight to Death Valley to catch the sunset and stay overnight at Las Vegas. At an area of about 3.2 million acres, Death Valley National Park is the largest national park outside Alaska. In fact its vast land spreads across the two states of California and Nevada. The landscape comprises of salt-flats, sand dunes, badlands, canyons, valleys and mountains. One of the popular spots in the park, Badwater is famous for being the lowest point in North America. Our drive left us very little time for exploring the other points of interest. The park ranger at the visitor center was kind enough to suggest a plan based on the time we had left before heading off to Zabriskie Point for viewing the sunset. Though we didn’t bring along a cake to cut or a candle to blow out, the fantastic views made for their absence. Though it will be a significant drive a second trip is not completely ruled out considering the trails which were left unexplored. All images appearing in this blog are taken by the author, unless specified otherwise.